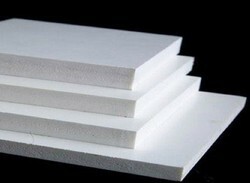 we are offring PVC Board Sheet. Ex-cel PVC Rigid sheet is extruded from Environmental friendly compound having smooth & glossy surface finish. Leveraging over the skills of our qualified team of professionals, we are instrumental in offering wide range of PVC Rigid Sheet. 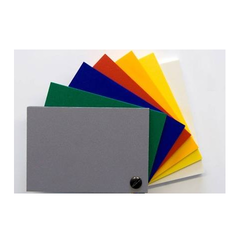 PVC Rigid sheet is extruded from Environmental friendly compound having smooth & glossy surface finish. We bring forth quality assured PVC Rigid Sheets which are acknowledged for its superlative durability and strength. These high quality products are widely applicable in various industries. Post production, these products are tested by our auditors to check their quality. Furthermore, customization can be done in these products, as per clients specifications. - Size: 8 x 4 ft.
We are offering PVC Sheet to our clients. Description: Extruded, dark grey in colour. Properties : Excellent chemical resistance & low moisture absorption, self-extinguishing, good dimensional strength & excellent performance vs. cost, easy to machine, thermoform, bond, weld, high mechanical & tensile strength, excellent electrical insulation properties.